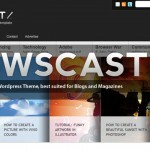 Newscast is a WordPress Theme, best suited for Magazines and Blogs. It comes with 3 fantastic Image and News slideshows has multiple Page templates and of course gives you the option to choose from 4 Fantastic skins. As always you can get the theme at themeforest. I just uploaded this theme and cannot get images to appear in the slider or on the main page. Can you help me? I have the same problem as john (as you know from fb). when you said “item comments” did you mean here? I just purchased your blog theme and wish to place the full size image at the top instead of the thumb to the side. How do I reference the filename for the fullsize image for that post? Also for the homepage, when I select Accordion slider, the title/header text is really really pixellated on IE, is there a workaround for this? I love this theme by the way, by far one of the much better looking and functioning themes I’ve seen. Great work. Hi Kriesi, I just purchased your theme. And so happy with it. Functions are well and using it without any errors. I just commenting here to thank you! I bought the theme and I love it, but I don’t know how I can change or add more social buttons in the rigth side of the header (there’re with the serch bar) (the buttons are there by default and I want to add some more). How do I change the text color of the scrip accordion? I’m using Newscast for bhopal.net. Brilliant theme, have absolutely no problems with it. There are some things I’d like to do which I can’t figure, and some things I’d like to suggest, would be great to have animated files in the slider for example, but it really is the best thing I’ve seen for years and so easy to use. Great work, keep it up. Very nice theme. Certainly one of my current favorites. Its is compatible with WP 3.0? I need to know how to call the Newscast Advertising Widget on a separate page/post. I follow your website for quite a lengthy time and have to have tell that your content articles usually prove to be of a high value and high quality for readers. Nearly all article marketers are so centered on the article writing process that they completely neglect to market their articles. I smart way to get you started is by means of social media marketing and search engine optimization.